In an attempt to use up an organic eggplant that I bought before it went bad, I decided to put together a quick and easy Weight Watchers stir fry recipe that would have a Szechuan flair. I just diced up some chicken breast, my eggplant, and a red bell pepper and cooked them with an incredible sweet and spicy sauce. It was all ready in less than 30 minutes, and it was absolutely delicious! I used a bit more oil in this recipe than usual because the eggplant is very porous and soaks up a lot. Next time, I may try hovering over it a bit more, and adding broth, tablespoon by tablespoon, instead of more oil, to save a few fat grams (and maybe a Point). But I DO love the flavor of that sesame oil, so perhaps it’s worth it. 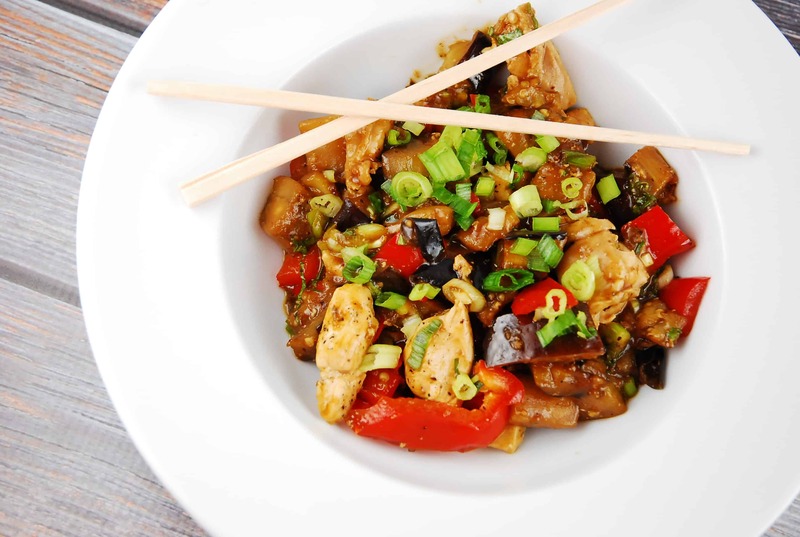 :) I felt that this Chicken and Eggplant Stir Fry Recipe was just as tasty as the ones I get at my favorite restaurants, but a LOT healthier, and a great “deal” at just 6 Points per serving. Just as tasty as the fast food version found at your favorite restaurant, this healthy stir fry recipe is a hit. It’s packed with fiber and protein, and is smothered in a deliciously sweet, tangy and spicy sauce that will definitely perk up your tastebuds. Heat 1 tbsp oil in a large skillet over medium high heat. Add in eggplant, season with salt and pepper, and cook until eggplant until seared and browned on all sides, about 5 minutes. Remove and set aside. Add remaining oil to the pan, and add in garlic, chicken and red bell peppers. Season with salt and pepper. Cook until chicken is cooked through, about 6-8 minutes. While chicken is cooking, whisk together the soy sauce, chicken broth, chili paste, ginger, vinegar, honey and cornstarch in a bowl. Pour the soy sauce mixture into the skillet and cook until the sauce has thickened, about 1-2 minutes. Put the eggplant back in the pan, tossing quickly, until the sauce is absorbed. Stir in the basil and half of the green onions and toss well. Remove from heat and serve; garnish with remaining green onions. Hands down this is one of my new favorite dishes! I made this tonight for dinner for the first time and this will be another addition to my meal rotation. Probably more often than others. Thanks for sharing! Darn it!! I was just at Trader Joe’s 4 hours ago. Wish I saw this recipe first!! Can you tell me what “dry” Thai Chili Paste is? I have Green and Red, but they are wet. Thank you!! I love Thai food and cant wait to make his. I have eggplant in my garden as we speak.